A statue of San Lorenzo Ruiz - a gift from Blessed John Paul II - found in the Sentro Pilipino in Rome. A few months ago, as we were touring several churches around Rome, we made our way to the Basilica of Santa Pudenziana. As we entered the courtyard of the church, there sat a lone sister on a bench quietly praying her rosary. Our tour group had come to Santa Pudenziana to see the oldest surviving Christian mosaic. What Jeremy and I discovered was the Filipino center of Rome. 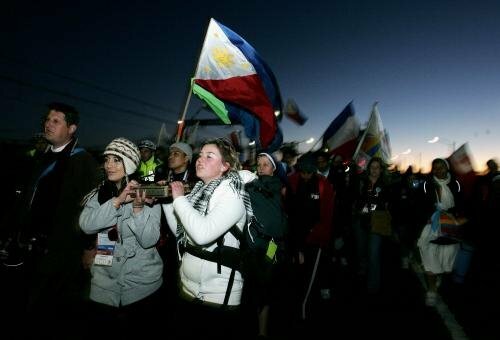 It was a refreshing experience, and a reminder of how beautiful the faith is amongst the Filipino people worldwide. Now, I will be completely honest, I haven't always been comfortable with my Filipino identity. There have been times in my life when I had great difficulty coming to terms with what it means to be Filipino or Filipino American. Let's see, I did have that phase of "Pinoy Pride" in Junior High, when all my notebooks were covered in that glorious golden sun surrounded by the trio of stars, and I adopted screen names like "NyceGuyPnoy" on Asian Avenue (don't laugh). I fried lumpia for the Filipino club fundraisers, I speak the language at home, and I am not afraid to admit that I enjoy watching Filipino movies. For a short period, I was studying various types of Philippine Martial arts, and I have one lonely trophy to prove it. At one point, I even had a job working at a Filipino-based organization on my college campus. Filipino culture is important to me, and alongside the visible cultural treasures, the invisible cultural values have definitely shaped me along the way. In many ways, I am very comfortable surrounding myself in Filipino culture. So why the identity issues? Maybe it was because too often I saw my brethren in the Filipino/Filipino-American communities rally around ideas and pleasures that I could not rally around. Or maybe I was jaded by the fact that I saw friends in college abandon their faith as a necessary part of the process of growing in their Filipino heritage or becoming a part of the Filipino community. Maybe given certain situations, especially in college, it was simply too hard to identify yourself as both solidly Catholic and proudly Filipino. One had to give. This was my experience, hopefully it isn't/wasn't yours. Returning to our discovery at Santa Pudenziana, exploring this Sentro Pilipino and speaking to this sister in Tagalog was a refreshing reminder that the faith is often the one thing that unites Filipinos around the world. Where my Catholic identity and Filipino identity were often at odds during college, in so many places around the world, you cannot separate the two. The voices were rich, melodic and beautiful. What I discovered as I spun around to look did not surprise me because I had seen and heard the same thing in other churches around the world. It was not a choir of angels with feathered wings and halos but a group of delightful Filipino Catholics with smiles of delight and joy on their faces as they worshiped God and sang His praises. I had seen this many times before in Rome, in Israel, in the United States and other countries. This joyful faith is the root of the martyrdom of San Lorenzo Ruiz, the first Filipino saint. The example of Lorenzo Ruiz reminds us that everyone's life and the whole of one's life must be at Christ's disposal. Christianity means daily giving, in response to the gift of Christ who came into the world so that all might have life and have it to the full ... To die for the faith is a gift to some; to live the faith is a call for all. And I guess that's where I find myself - I hope to be as Filipino as San Lorenzo Ruiz.